One of Trump's own former National Security Council officials texted: “Dude. This is a total [effing] disgrace. The President has lost his mind." CBS "Face the Nation" anchor Margaret Brennan, who was in the audience, told AP she was messaging some U.S. officials during the speech who said they were turning off the television. The prevailing theory among Trump aides and alumni is pretty simple: "He can’t separate meddling from colluding," said one source close to Trump. "He can’t publicly express any nuanced view because he thinks it concedes maybe there's something he did wrong." Trump has, at times, privately conceded that Russia probably hacked. But the minute the word “election” comes up in conversation, his brain shifts into an attack mode that throws U.S. intelligence out the window and delights Putin. The source added: "His P.R. and legal strategy right now is to impugn the FBI in order to inoculate himself from the Mueller investigation writ large." 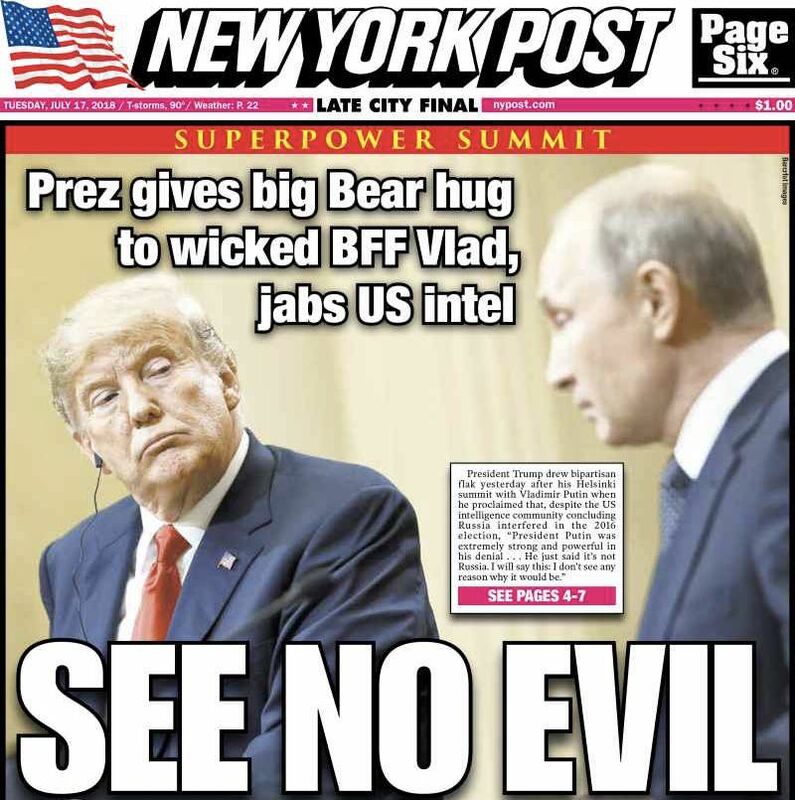 Jonathan Swan — who was sitting 20 feet from Putin, in the second row of the ballroom in Helsinki — reports that the Russian leader smirked his way through the questioning over election interference, puffing and thrusting his chest at U.S. reporters. Trump nodded along at times. When the two leaders walked out from under the golden glass chandelier and left the room, they left a speechless press corps. 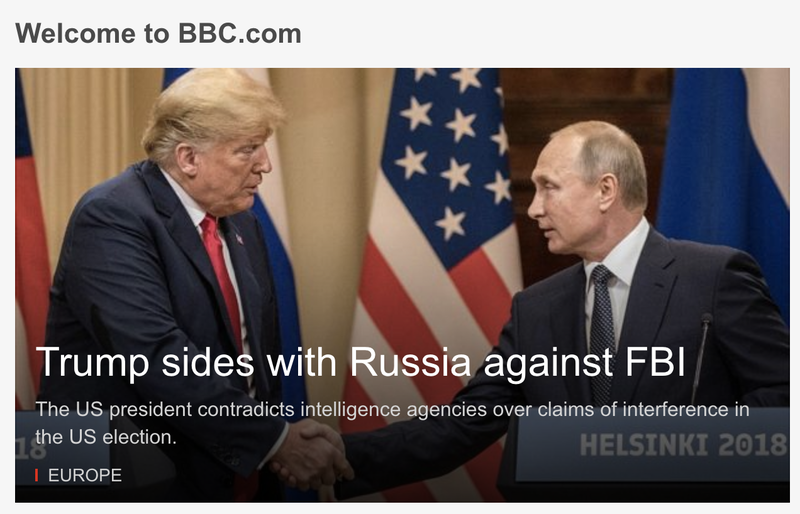 The journalists were questioning whether we actually heard what they heard: The president of the United States was putting the methodical assessments of his own country’s intelligence services on an equal footing with the denials of one of America’s most underhanded enemies. 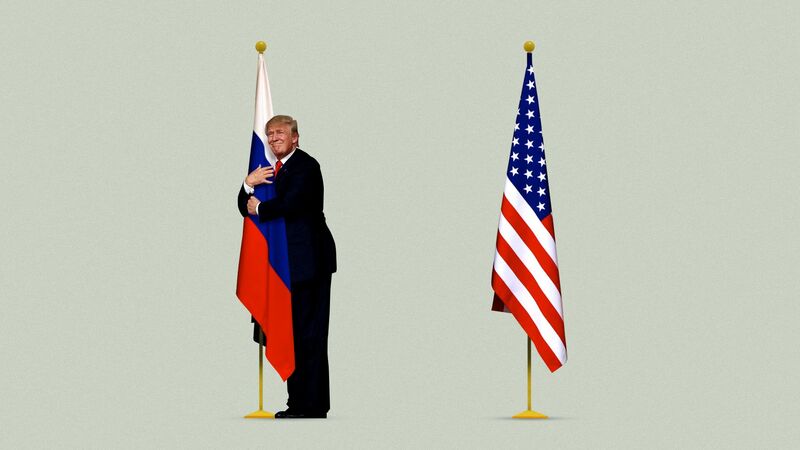 Trump said: "I have great confidence in my intelligence people, but I will tell you that President Putin was extremely strong and powerful in his denial today. And what he did is an incredible offer; he offered to have the people working on the case come and work with their investigators with respect to the 12 people. I think that’s an incredible offer." Why it matters ... Jeremy Bash, former chief of staff at the Pentagon and CIA, told Brian Williams on MSNBC: "Ronald Reagan won the Cold War. Today's Donald Trump lost the post-Cold War for the United States of America." 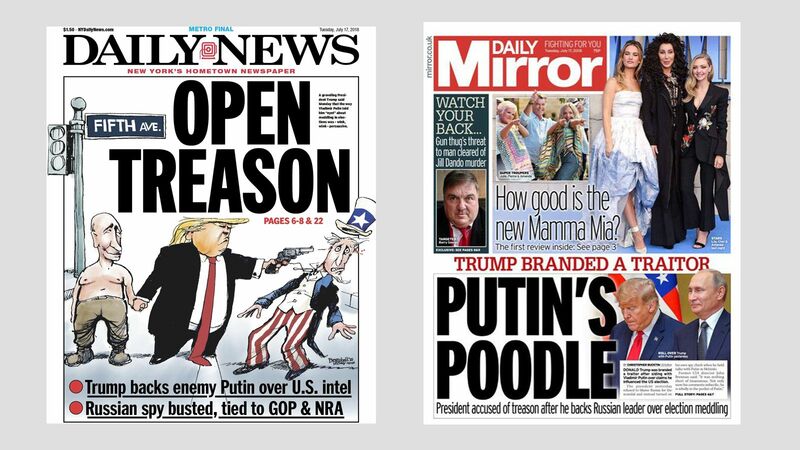 From a front-page N.Y. Times analysis by White House correspondent Mark Landler: "His statements were so divorced from American policy goals, so at odds with the rest of his administration, so inexplicable on so many levels that they brought to the surface a question that has long shadowed Mr. Trump: Does Russia have something on him?" Anchors and commentators, who already had become loose with their language, became untethered from journalistic norms, just as Trump had abandoned presidential norms. On CNN, Anderson Cooper called the performance "disgraceful" and Chris Cuomo called it "a betrayal." The #1 "Most Popular" piece on NYTimes.com last night was a column by Thomas Friedman, who's no partisan hack, declaring "overwhelming evidence that our president, ... is ... engaged in treasonous behavior." Friedman added: "Every single Republican lawmaker will be — and should be — asked on the election trail: Are you with Trump and Putin or are you with the C.I.A., F.B.I. and N.S.A.?" N.Y. Times Qu0te of the Day ... Sen. John McCain: "No prior president has ever abased himself more abjectly before a tyrant." Newt Gingrich, one of the most vocal Trump backers among establishment Republicans, tweeted: "President Trump must clarify his statements in Helsinki on our intelligence system and Putin. It is the most serious mistake of his presidency and must be corrected — immediately." Republican congressional leaders said they believe the intelligence community. Drudge, usually a Trump champion, bannered: "PUTIN DOMINATES IN HEL." Future foretold: It’s highly unlikely any top White House officials will quit in protest; inconceivable congressional Republicans will do anything other than complain (mostly gently) in public; and unimaginable Trump will regret or rethink his pro-Putin approach. Fox Business host Neil Cavuto: "[D]isgusting. ... It's not a right or left thing, it's just wrong." Fox News host Laura Ingraham: "Don’t use 'strong and powerful' to describe Putin’s denial re. election meddling. Use words 'predictable and damaging to U.S.-Russian relations' to describe Russian meddling." Fox Business host Trish Regan: "This was clearly not [President Trump's] best performance." Fox News senior political analyst Brit Hume tweeted the president's response on Russian interference was "[l]ame ... to say the least," and leaves "the distinct impression he puts Putin’s credibility on a par with U.S. intelligence." In Helsinki yesterday, the limos of Putin (left) and Trump. "Mariia Butina ... was arrested on Sunday and appeared in court in Washington" yesterday. Why it matters, per WashPost: "The case, which is not part of the special counsel investigation into Russian interference, lays out the strongest allegations to date of American involvement in Russia’s influence operations." The Treasury Department "will no longer require certain tax-exempt organizations including politically active nonprofit groups, such as the National Rifle Association and Planned Parenthood, to identify their financial donors to U.S. tax authorities," Reuters reports. Why it matters: "The policy change [is] heralded by conservatives as an advance for free speech." Why it matters: Technology has enabled politicians to change or mimick real stories and news outlets to mislead voters. Kevin Kelly, co-founder of Wired magazine, in Pew's latest report on misinformation online: “Truth is no longer dictated by authorities, but is networked by peers." On the left, New Jersey Sen. Bob Menendez has set up a website called HealthNewsNJ.com that at first glance looks like an upstart health website, but is actually backed by the senator's campaign, per STAT. While not directly mentioning Trump, Obama's speech is expected to be a rebuke to many of his policies. "14,000 people were gathering at a cricket stadium for the speech." "This is Obama's first visit to Africa since leaving office in early 2017. He stopped earlier this week in Kenya, where he visited the rural birthplace of his late father." "When Obama was a U.S. senator he had his picture taken with the newly freed Mandela. After Obama became president he sent a copy of the photo to Mandela, who kept it in his office." "Big data aren’t new in admissions, with colleges targeting prospects in certain ZIP Codes or with particular test scores, for decades. But the schools have come a long way in embracing consumer marketing techniques." "While traditional college prospects are easy to find — in high schools, with plenty of data on their family income and academic interests available for purchase through the companies that administer standardized tests — adults who may want to complete their degrees or pursue graduate studies are trickier. " Why it matters: "An extremely tight labor market means adults can find decent-paying jobs without advanced degrees, or in some cases without any postsecondary credentials." "That makes pricey programs a tough sell, even if there is payoff down the line. Undergraduate and graduate enrollment by students over age 24 fell by 6.8% between fall 2015 and fall 2017." Why it matters: "It’s a major issue to work through, especially if in-game betting — people betting on various aspects of games after they’ve already started — catches on in the United States the same way that it has in the United Kingdom."